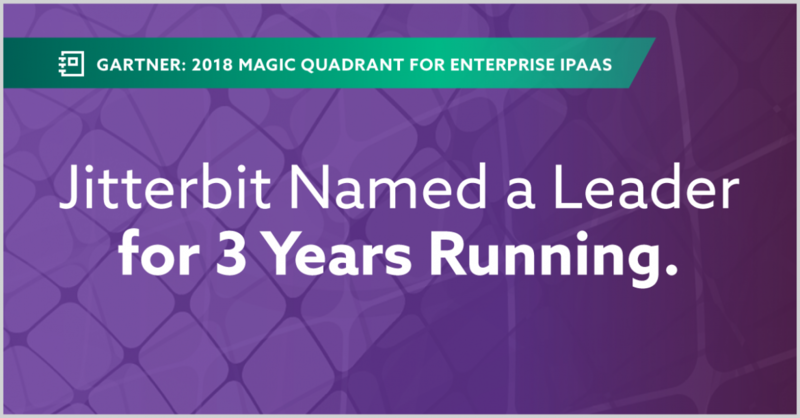 ALAMEDA, Calif. April 20, 2018 – Jitterbit, the API transformation company, today announced it has been positioned by Gartner, Inc. in the Leaders quadrant of the Magic Quadrant for Enterprise Integration Platform as a Service for the third year in a row, improving upon its position in 2017 and 2016. Gartner evaluated Harmony, Jitterbit’s award winning API Integration Platform, for this year’s Magic Quadrant. “We believe that being recognized by Gartner year after year highlights our ability to innovate and our commitment to continually add game-changing functionality to our powerful, versatile platform. We feel that our placement in this year’s report and the 100% unconditional recommendation reported by our customers, reflects our ability to consistently provide successful outcomes for companies that select Jitterbit. We intend to remain, in our perspective, a beacon for organizations seeking to ‘get the job done right’ while making their businesses more efficient, effective, and enduring,” said Jitterbit CEO George Gallegos. Jitterbit Harmony simplifies the integration process, allowing enterprises to quickly connect to any application, data source, device or API with pre-built templates and workflows to intelligently automate business processes. More than 50,000 users in a variety of verticals use Jitterbit’s products to rapidly move data, automate processes and build a 360-degree view of their business. Harmony satisfies businesses’ desire for a modern, collaborative approach to enterprise integration by making it easier for IT personnel to work in tandem with business users. Furthermore, the Harmony enterprise IPaaS platform enables businesses to infuse any application with artificial intelligence, such as real-time language translation, speech recognition and product upsell recommendations, to make better decisions. Today, applications enable organizations to transform their operations, enabling truly digital and agile business. Jitterbit Harmony enables enterprises to easily connect the thousands of applications that power digital business, with a turnkey platform for popular integration workflows. With Jitterbit, enterprises can quickly develop repeatable integrations that can be made broadly available to employees, partners and customers as part of managed collaboration between integration experts and non-technical users. Gartner “Magic Quadrant for Enterprise Integrations Platforms as a Service” by Keith Guttridge, Massimo Pezzini, Eric Thoo, Bindi Bhullar, Betty J. Zakheim, April 18, 2018.